Premier Quality Investment Castings Delivered in Days, not Months. American Casting Company applies modern manufacturing principles to an age-old metal working process. Historically, Investment Casting (Lost Wax Casting) has been viewed as having slow development cycles with long lead times. American Casting created a leaner, more effective system. We incorporate lean production philosophies with the latest technology, delivering complex parts with ultra-fast standard lead times. Our best-in-class methods consistently meet the most stringent aerospace and medical industry quality standards. 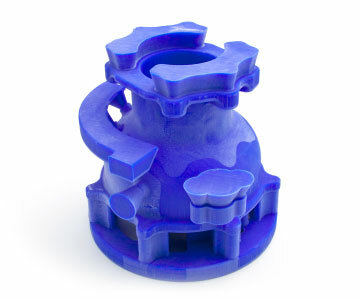 Whether manufacturing prototypes, or first article and custom production products, we utilize the latest in 3D printing equipment and manufacturing technologies. We also specialize in the processing of nickel based superalloys (Vacuum Melt), cobalt based alloys, including implant grade CoCrMo, stainless steels and other critical aerospace and medical device materials. View our materials and capabilities. Cycle Time and Lead Time Measured in Days. We’ve created a new industry benchmark. American Casting’s unique system means that you no longer have to wait months to receive quality investment castings. Our unique system combines linked processes with lean principles to eliminate queue times. We have a consistent flow of product helping us to quickly and reliably meet our customers’ needs. The same unique system that gives us world class speed gives you extreme flexibility in making changes. We implement your change requests almost instantaneously. This means that you can increase quantity and make other changes without incurring setup charges or increasing lead time. 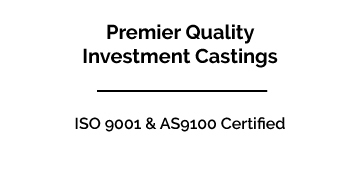 American Casting Company’s quality system is certified to AS9100 and ISO 9001. We also regularly receive high customer satisfaction scores for product quality and on-time delivery. Short process cycle times and the use of the latest manufacturing technologies allow us to give you the highest in quality and responsiveness.